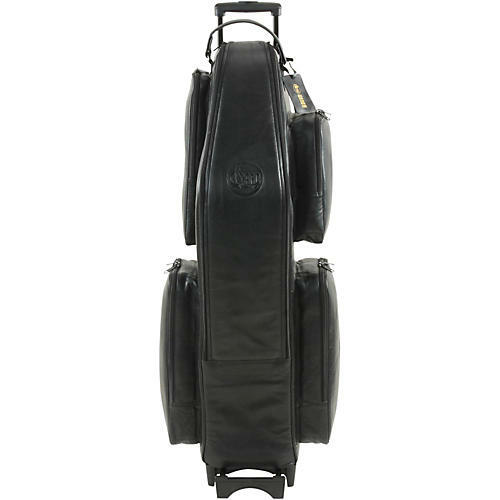 The Gard Low A Baritone Saxophone Wheelie Bag features several ways to transport your instrument, great protection, and room for a lot of accessories. Four wheels and a six position, telescoping handle make using the bag smooth with a customizable level of comfort. An extendable bottom base will help prevent the bag from tipping over. If wheeling the bag isn't possible, padded backpack straps or a thick shoulder strap make carrying comfortable. A padded flap conveniently folds over the wheels for both comfort and to protect clothing from dirt. Gard Bags are known for their high-quality protection, and the Wheelie Bag Series is no exception. Dense foam surrounds the bari sax and padded blocks can be placed where they best fit for maximum stability. An expandable exterior pocket provides more than enough room for accessories, music, and even a few personal items. To protect the leather version of the bag during inclement weather, a rain cape fits snuggly around the outside of the case does not come with synthetic version). This cape also has a reflective logo to make sure you're noticed in the dark. There is not another bag that provides so many options and high quality protection at such an affordable price.